Get your kids involved in USTA Junior Team Tennis today - just for the fun of it! If your kids love tennis, they will love it even more as part of a team! Play in USTA Junior Team Tennis involves singles and doubles. Best of all, USTA Junior Team Tennis is for children of all ages, including those 10 and under, where programs utilize the 10 and Under Tennis format with smaller courts, shorter and lighter racquets, and lower-bouncing and slower-moving balls. Younger kids enjoy team competition close to home, but as kids progress, top teams can experience the thrill of competing for State, Sectional and National Championships. 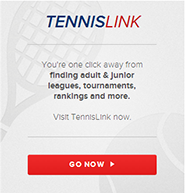 Being a part of Junior Team Tennis requires USTA membership. For information on USTA membership and benefits, click here. The USTA is currently offering a free first year membership for all children ages 10 and under. Click here for more information. The Charlotte USTA Junior Team Tennis Commission is comprised of the Area Program Coordinator and other representation for USTA Junior Team Tennis in the community. The Commission may meet up to three times per year for the purpose of evaluating the present status and effectiveness of the program; and to assist the Area Program Coordinator with planning and organizing for the continued development of the league. Commissioners will serve as mentors to assist new and existing sites, site directors, tennis pros and team parents. Reviewing the accuracy of the posted schedules. Monitoring forfeits by division and site. Monitoring the scores/standings to be sure they are up to date. advancement to the playoffs or State Championship in the Spring Season. other Commissioners for clarification or resolution. Determining best course of action regarding grievances.